Sometimes I think I’ve been a little too harsh on the modern styled GI Joe figures. I think I’ve alternately called them less playable, and even gone as far as calling them statues. Granted, in many cases, I still stick with those assessments. But there was a time, at the beginning of the Pursuit of Cobra line, when I was totally jazzed by the new offerings. Have I changed my opinion on the modern style? Not really, but moving through a bunch of the first series PoC figures looking for blog subjects again has tempered my feelings a bit. As much as I like to be curmudgeonly about recent action figure offerings (and not just GI Joes) in the hyper-articulated style, I had to say, “Hot damn!” when I broke out this Beachhead. I was mightily impressed four years ago when it was released, and it still makes me smile. There’s a real presence of the old Beachhead here, attitude and all. There are enough of the old hallmarks still around, from the texture on his mask, to the color of his pants, to take me back to 1986 while grooving on a high-tech update. I know next to nothing about modern military hardware and gear, but this guy evokes the kind of “near future” aesthetic that the 80s Joes maintained for their first few years. Surprisingly poseable when compared to the older 25th anniversary versions of the famous ranger, Beachhead is the beneficiary of articulation improvements that began in the Rise of Cobra line. The hands hold the rifles pretty convincingly, and the vest, though it restricts movement, is fitted well. 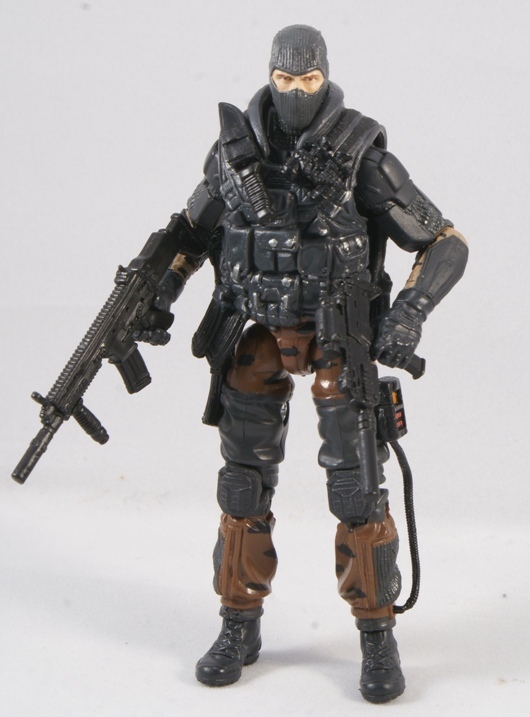 Like the first version from the old days, Beachhead is festooned with gear and weapons, and includes an arsenal of weaponry to rival the more recent Retaliation Duke figure. He’s even got a bit of stowable gear in the form of his flippers that handily plug into his back. Hey, play value! There’s no mistaking who this figure is, and at the same time, it isn’t a slavish recreation of the original 80s predecessor. That’s something the Pursuit of Cobra line accomplished on more than one occasion. In my opinion, this was probably the best figure out of that first wave of Pursuit of Cobra. Everything came together so well to create a nice modern update for Beachhead, but there were also some good references to the original figure so it still felt like Beachhead. I just have to wonder–why did he include flippers? As I recall from the Design Team panel at Joe Con where he was unveiled, the idea was that the flippers (and helmet with built in gas mask/rebreather) were part of the mission gear that would be used to insert him into the big city via the coast and in deeper via the sewers. I think they’re fun, but I think it would have been helpful to have referenced this idea in the limited filecard he had. With the exception of the lower body, this looks way too much like Firefly. I think they should’ve added more of his familiar green coloring. Beachhead is in my top 3 Joe characters, and this version rocks so hard! I love the detail and general “bad mutha” feel to him. This was an update that did not disappoint! Never underestimate the power of play value. It’s the key factor which separate the toys from the statues. I picked up a P.O.C Destro a few days ago and i was really impressed with him. It makes me angry that P.O.C was only available down here in a few specialty stores as the first movie stuff had done so badly. I heard Mark Bellarmo say on an episode of W.O.J.M that he likes going through the P.O.C figures in his collection whilst watching Madmen. My mother has a Walter “Hiesenburg” White figurine. It has no points of articulation so i’ve been calling it a statue. @Clutch/Skymate – I think the key word is ACTION figure – if there’s no play value, there’s no action and it’s a statue. Coincidentally, I’ve just glued the legs and arms of a spare CC figure in place to make a statue. I’ll try and post it on joedios.com later today. @Acer – I just have to wonder – why his pocket calculator is connected to his sock…?? I’ve always been amazed by the head sculpt of this figure. There have been several pics of him that make me question as to whether or not, the photographer ‘shopped real eyes into the face mask. Such a small amount of sculpted face, but it usually looks so realistic in pictures. Or maybe I’m just weird like that. This is one of those PoC figures that made me think the whole line was really taking off. The 30th were great, too. Then the wave 1 Retaliation figures came out and I woke up. Beachhead here is playable (a toy), but he looks interesting (and not ridiculous). This looks nothing like Firefly. 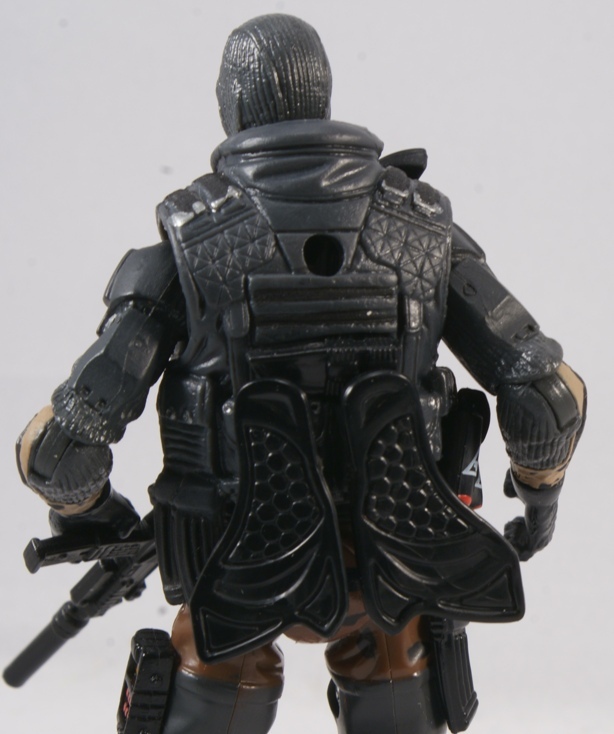 Upon closer examination, I do agree that it looks less like Firefly than when I first saw the figure. However, from the waist up to the head, it doesn’t exactly not look like him, either. This is an awesome, awesome figure. Looks like a modern GI Joe should: he’s got realistic gear and he looks like he’s ready to fight! POC and 30th Joes were great. 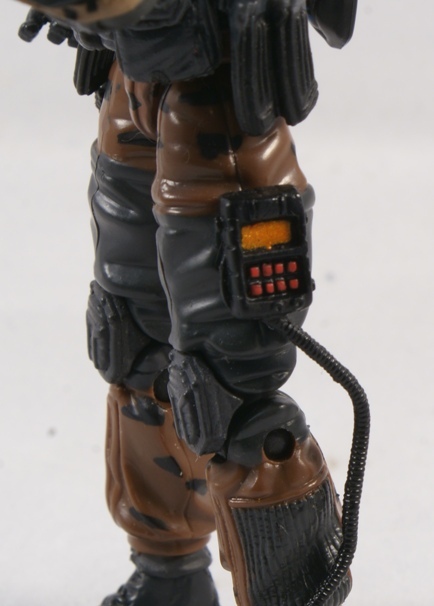 I wish that we’d seen re-use of this body as much we did the Cobra Shock Trooper from the same wave, as the body armor sculpt on the torso and arms is unique and top-notch. The GPS is a cool accessory, as are the knives and binoculars. He came with a ton of great weapons, too. The only complaint I have, and I hate to even complain about what I consider an excellent figure, is that his grip could be tighter. I don’t even mind that his wrists only swivel and don’t elevate, but mine has trouble holding some weapons securely.